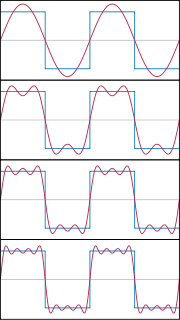 In mathematics, a Fourier series decompones periodic functions or periodic signals intae the sum o a (possibly infinite) set o simple oscillatin functions, namely sines an cosines (or complex exponentials). The study o Fourier series is a branch o Fourier analysis. This page wis last eeditit on 12 Dizember 2013, at 14:12.